As we gear up for the 42nd U.S. Marine Corps Marathon, where Rosslyn will host the Finish Festival October 22 (be sure to check it out; it's not just for runners! ), we're featuring articles about one of life's most freeing and accessible fitness activities: running! In this first piece, we give you step-by-step guides for getting a great running workout in the neighborhood in less than an hour. If you try these runs or have other favorite routes to share, post it on social media with #RunRosslyn! We love hearing what you're up to in the neighborhood! Running: We love it for so many reasons. It's very efficient: You need no equipment and you can do it anywhere, anytime. Even a quick, ten-minute jaunt around the block is beneficial. For some, it offers time alone, away from the distractions and demands of work or family life. Running gives you — the runner — ultimate control. If you get tired, you can walk. If you want to push yourself, you can speed up. If your knees hurt, you can race walk. And when you're finished, the feeling of satisfaction at having just done something good for yourself is palpable. It's addictive. Even if you start slow, or start with a short distance, you're fitting it in. Everyone who wants to get in better shape should at least give it a try. You can easily do this approximately 4 1/2-mile run on your lunch hour or before or after work. When you're running it, you'll be struck by just how close Rosslyn is to some of the D.C. area's most significant attractions. 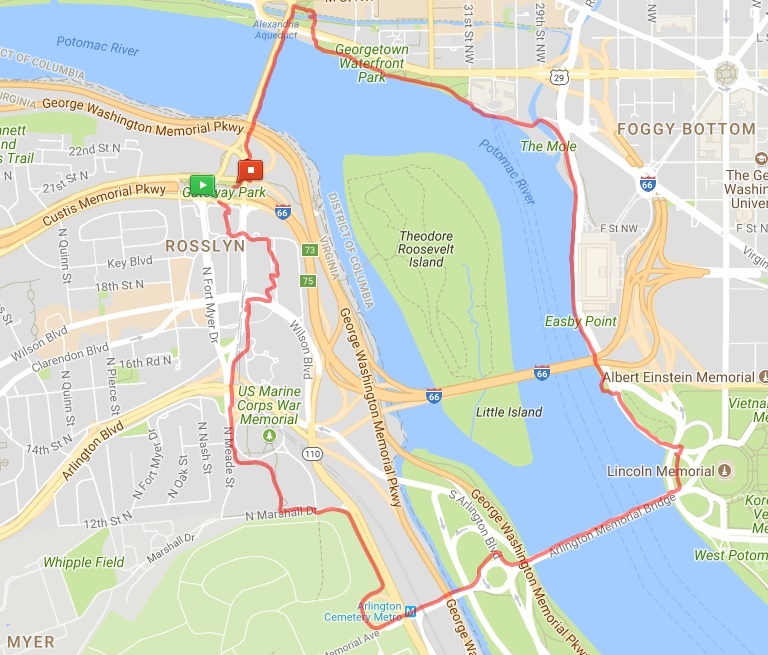 This loop run features spectacular views of the U.S. Marine Corps War Memorial, the Netherlands Carillon, the Washington Monument, the U.S. Capitol, Arlington National Cemetery, the Potomac River, the Lincoln Memorial and Georgetown Harbor. The terrain is mostly flat with some hills. If you don't want to do four miles, just do part of it and make it an out-and-back. You'll still get to take in some beautiful sights. 1. From the corner of Wilson Blvd. and N. Lynn St., head south on Lynn St. You'll pass Rosslyn's Dark Star Park, a wonderful piece of land art by artist Nancy Holt. 2. As you cross Arlington Blvd., Lynn St. becomes Meade St. Continue on Meade St. At 14th St. N., pick up the trail on your left. Pass the U.S. Marine Corps War Memorial and the Netherlands Carillon. 3. Cross N. Marshall Drive and continue to follow the trail. You'll be running alongside Arlington National Cemetery. 4. Turn left onto Memorial Ave., the entrance road into the cemetery. You'll pass the Arlington Cemetery Metro Station and the Seabees Memorial. Continue on Memorial Ave. around Memorial Circle and cross into D.C. on Arlington Memorial Bridge. You'll run over the Potomac River and have a wonderful view of the Lincoln Memorial at the end of the bridge. 5. After you cross the bridge, turn left onto Rock Creek and Potomac Parkway at the lion statues. You'll run along a path that parallels the Potomac. Stay on this for a while (about a mile), passing the Kennedy Center and the Watergate. When you reach Virginia Ave., turn left to go over a small pedestrian bridge. It's hard to find so you need to pay attention. Surprise: once you go over the bridge, you're at Georgetown Harbor! 6. Continue along the path that parallels the Potomac. You'll pass Washington Harbor and Georgetown Waterfront Park. At the end of the park, turn right to go up 34th St. Cross the bridge over the C&O Canal. 8. Proceed through Francis Scott Key Park to the Key Bridge. Turn left onto the Key Bridge. Run all the way across, again enjoying the spectacular view of the Potomac. 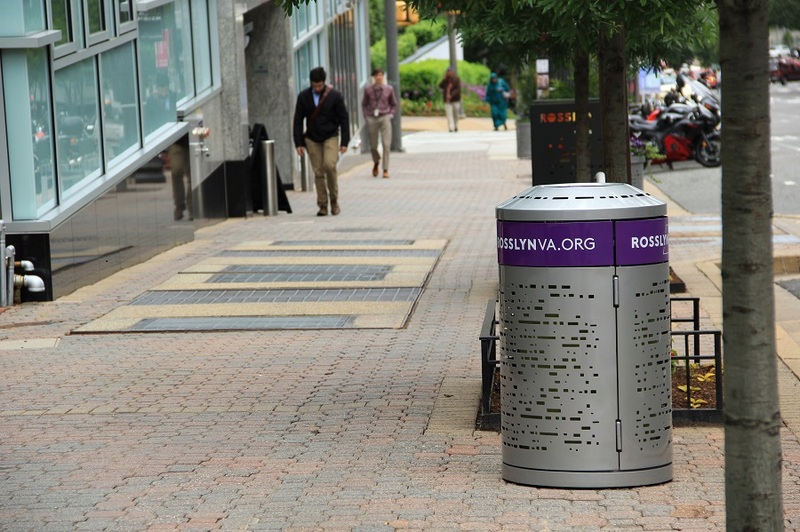 At the other end, you'll be back in Rosslyn! We love our hills! Interval training on Wilson Blvd. People sometimes joke about Rosslyn's hills, but from a health and fitness perspective, they are an asset! We asked Victor Carcamo, the Rosslyn BID's operations director and owner of the HIIT Nation fitness company, how to incorporate our neighborhood's topography into a high-intensity interval training (HIIT) running workout. He had lots of ideas! The basic premise behind a HIIT workout, says Carcamo, is that you should continually put forth a maximum effort followed by a rest period. So, to do HIIT with running, you might sprint as fast as you can for 30 seconds, then walk for 1-2 minutes, then sprint again for 30 seconds, then walk, and keep repeating the cycle. Carcamo says the amount of time you spend on each sprint interval can be based on your own fitness level, with one minute probably being the maximum length. He says you want your sprints to "get you in a state of being uncomfortable." "Push yourself as if you were racing against someone," he says. Start at the beginning of the sidewalk at the base of Wilson Blvd. (where Route 110 starts and near the London House apartments). Head up the north side of Wilson Blvd., using lightpoles to measure distances. Walk from lightpole to lightpole, then sprint from lightpole to lightpole, then walk. Continue up the hill, using lightpoles to designate the beginning and end of each interval. By the time you reach Oak St., you'll have done seven sprints. If you wish to continue, stay on the north side of Wilson Blvd. (same side as Roti) and continue your intervals. It's 11 sprints total by the time you reach Pierce St. If you cross over to the south side of Wilson (Target side) you can continue all the way to Quinn St., which would be 13 sprints total. This whole workout should take the average person about ten minutes. Carcamo says you'll see results after doing it just once. We've done HIIT with running and — trust us — if you push yourself, it is hard. As in . . . panting and wheezing hard . . .dripping with sweat hard. But in a good way, of course! Another outdoor workout spot in Rosslyn where you can do HIIT: ten flights of outdoor stairs on Nash St. behind the Holiday Inn, just across from the hotel's parking garage. Carcamo recommends starting your workout with an easy, 5-10 minute jog around the neighborhood. When you get to the stairs, sprint up as fast as you can. Then, walk down slowly. Repeat as much as you want. It takes him about 30 minutes to do 12 sets. For both of these HIIT workouts, you can incorporate 30 second intervals of exercises such as burpees, pushups, mountain climbers, jumping squats, high knees and side-shuffle squats. The main point, however you want to do your HIIT workout, is to create periods in which you're working at your maximum capacity. So what are you waiting for? Let's get out there and do it! Photo above: Don't fear the hill: It's a real asset in doing high-intensity interval training!